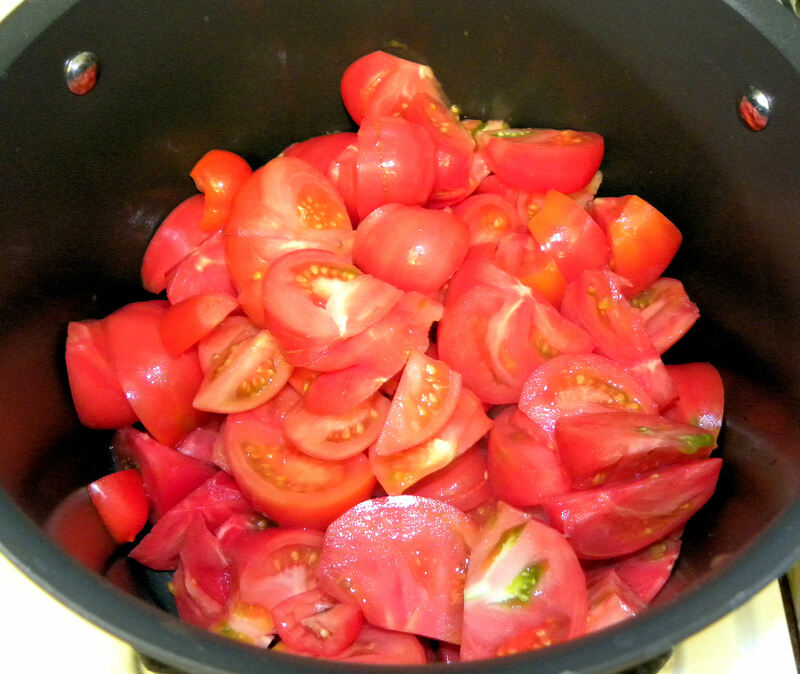 Posted on September 24, 2010	by Lou Murray, Ph.D.
Are you getting tired of tomatoes yet? When they’re gone, I’ll miss them, but right now I’m getting a bit weary of non-stop spaghetti sauce. Still, that’s easier for me than canning them. Lord knows we can’t eat them all fresh. Maybe planting 19 tomato plants was overdoing it a bit. We had our first Brandywine tomato yesterday in a salad Nicoise. Oh my, I see why people rave about them. The flavor put my Black Krims to shame, and I love the Black Krims. There was a complex flavor-burst of tomatoey sweetness mixed with a pleasant acidic contrast, loads of flavor. Wish I had photographed the salad, but we gobbled it up too fast. After they simmered for a half hour, I put them through my mother's old 1930s colander, which chefs these days call a chinois. 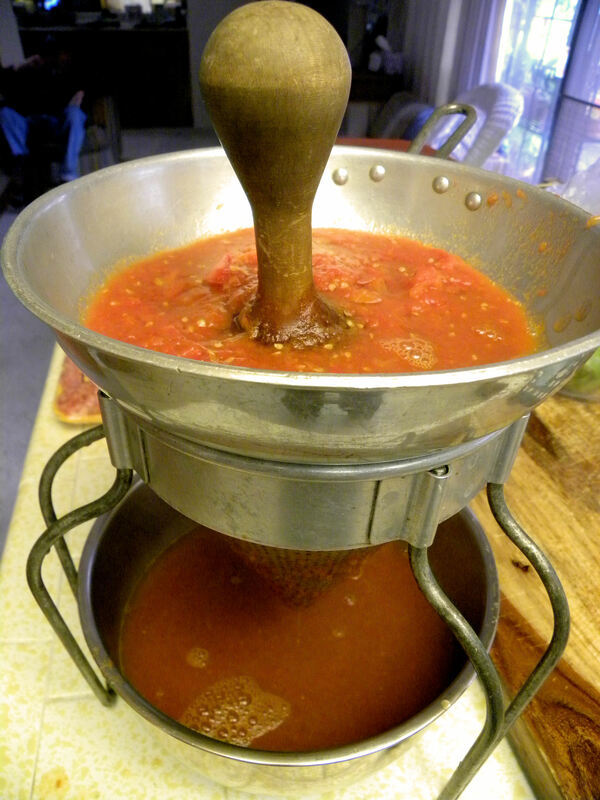 I browned an onion and some garlic in olive oil, poured in the strained tomato sauce, added a small can of tomato paste and some oregano from the garden and simmered it until the consistency was just right. Some of this batch got mixed with Italian sausage and poured over linguini. Some of it got mixed with ripe olives and sliced browned sausage and poured over spaghetti. And the rest got frozen. 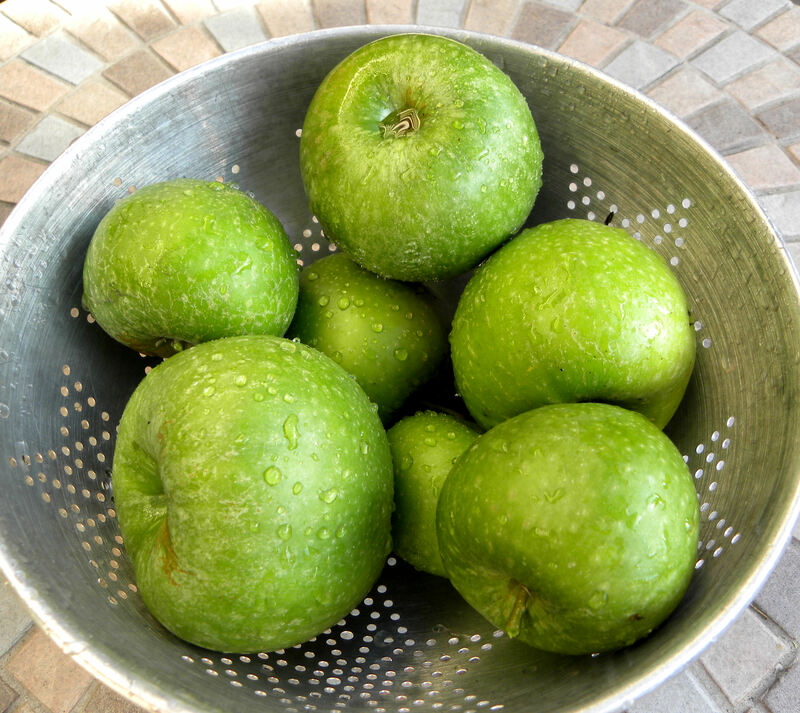 This is the last harvest from my Granny Smith apple tree. Critters got nearly half my crop, but I still got a pie and two apple Brown Bettys out of it, plus apple pancakes and apples in the two batches of guava jam that I made. We didn’t get enough apples this year to get tired of them. Darn it. The tree produced a respectable 30 apples, but we got barely more than half of that number. Next year, I’m going to stake the heavy branches and cover the tree with netting. Do I really say that every year? Do I really forget to do it every year? Well, there’s always next year. This entry was posted in Uncategorized and tagged Granny Smith apples, how to, photos, recipe, spaghetti sauce, tomatoes. Bookmark the permalink. 2 Responses to How long will the tomatoes hold out? I know how you feel about tomatoes. I’ve pulled most of mine out though so I won’t get too many more. Thank goodness. But you are right. I’ll miss them when they are gone. Daphne, isn’t that the truth? We yearn for some ripe, fresh, homegrown tomatoes during the dead of winter, and are then sick of them by October. I actually got to missing lettuce this month, as I didn’t plant any during what were supposed to be the warm summer months. We didn’t get any heat, so lettuce would have been fine. Well, I’ll get some in the ground soon.